There are hundreds of ghost towns in Colorado. Most of these are reminders of a gold rush long past. Others were once farming communities that could no longer sustain crops, or failed social experiments. Often, there is nothing left to these towns to indicate they ever existed. One of those towns, Missouri City, also called Missouri Flats, has only one thing to mark its existence. The grave of a small child. Unlike its neighbors, many which are themselves ghost towns, places like Russell Gulch, Nevadaville and Lake Gulch, (and of course almost-ghost towns Central City and Black Hawk) which sprung up as gold mining towns, this town was the headquarters of the Consolidated Ditch Company, which was building the infrastructure for the water supply for the Central City area. The town was big enough to have a post office in 1860, and almost 600 people called it home. Three years later, the post office was closed. By 1940, as today, this fenced in grave remains the only evidence that there was once a place called Missouri City, and it’s not very good evidence at that. After all, there is no mention of the town written anywhere on the stark black fences. The outer fence, which surrounds the fenced in grave, is locked with padlocks that, while a contemporary addition, look to be rusted closed. The little girl whose grave lies within, once had a marble marker (the base remains), that is long gone. A small gray angel has been added, and a simple wooden marker gives the scanty details of a short life. “Clara A, dau. of D.E. 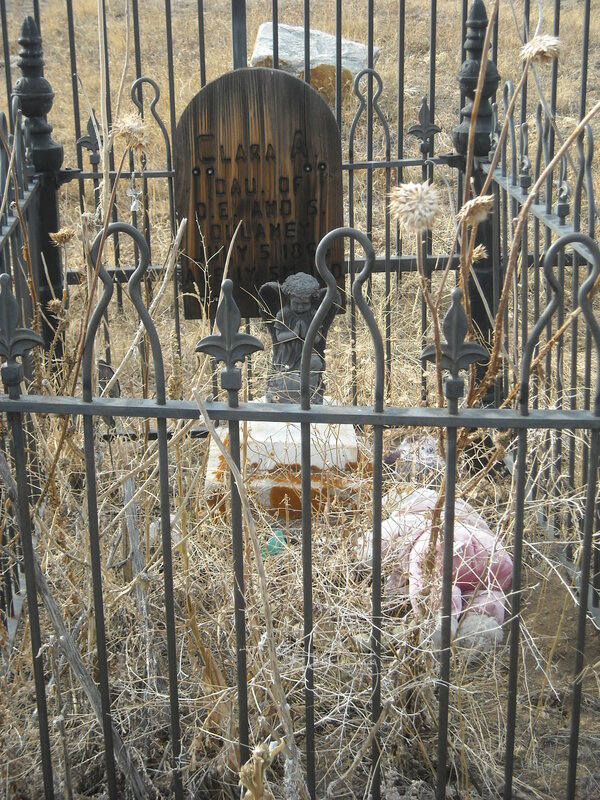 and S. Delaney, July 5, 1865, Aged 1 y, 5 M, 12 D.” A stuffed bear has been left within the last few years. 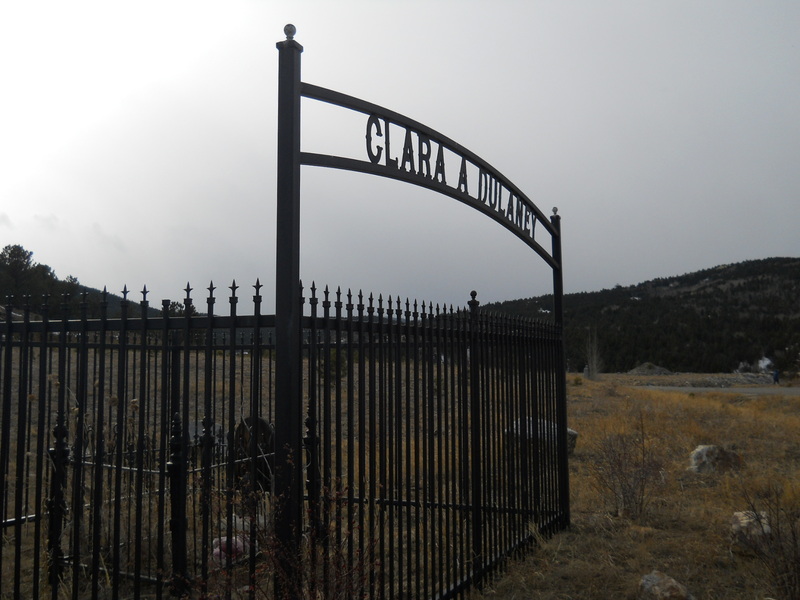 This is not the only ghost town whose existence is marked only by the cemetery. Most of these sites have more than one grave marker. These stone memorials of those who lived and died in a place become the only monument of the place they knew. In Summit County, there’s also Parkville, which was the county seat in the 19th century. We visited the Missouri City site yesterday, and despite persistent rumors over the last decade that this humble reminder of the area’s pioneer past will soon be no more, possibly paved over for gambling parking, or other “progress,” it’s still there. If you want to see this spot, head towards Central City over the Parkway. When you enter town turn right at the stop sign, then another right on the opposite side of the big casino parking lot. Turn onto the Virginia Canyon road, and follow it across the Parkway. Immediately at the end of the bridge, take a left, and follow it past the maintenance vehicles and maintenance buildings. The fenced plot will be on your right. *Images can be clicked for a larger version.